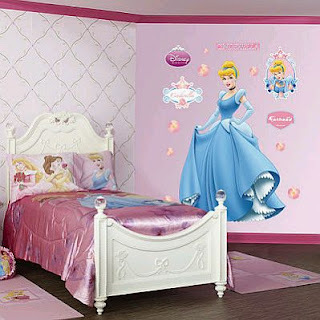 When we think about our children, we dream of the best and make them live in a fantasy world, full of love and positive things, this is an important part of decorating their bedroom. 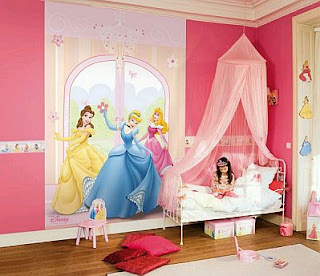 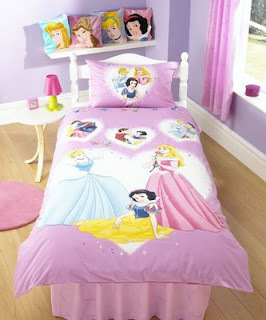 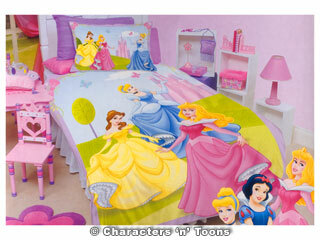 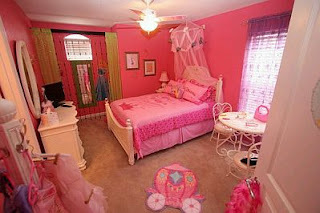 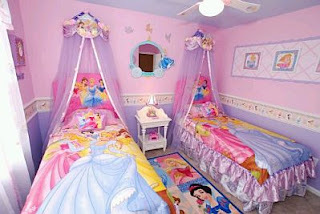 Thinking of this need is that Below are some ideas for decorating the room of your childs, with the Disney Princesses. 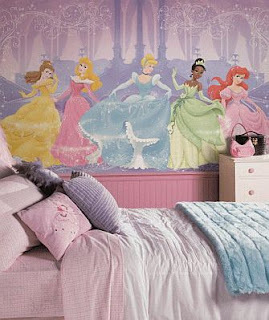 In this first proposal have a room painted in pink, on the side wall a picture of Cinderella, although it may be your favorite princess, and the bedding is of the Disney Princesses. 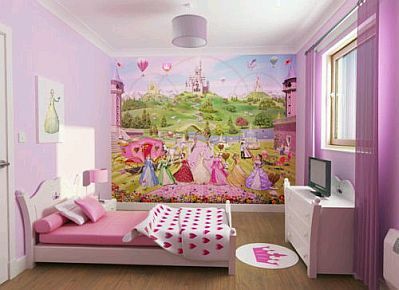 Another cute proposal colored walls with very light pink curtains and pink bedding and a screen, table and lamp Princesses on the wall on which rests the head, a beautiful castle. 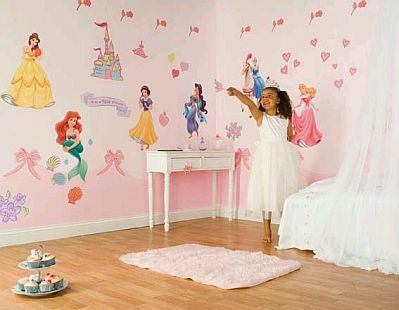 An interesting option is to decorate the walls with stickers of princesses and complement the decor with white furnishings. Delicate and elegant, this approach is ideal for a girl who not only likes princesses, but who likes to live as one, the room is painted lilac, the curtains are the same color but more intense while furniture are pink, in one of the walls there is a great sticker of the Disney Princesses, and behind a beautiful castle. This is an approach of the stickers of princesses, the big advantage is that they are removable. And if home have two princesses, you can also create a dream world in their room, in this case the bedding is of the princesses and among them a beautiful rug with the face of these complements the decor. In this room the walls were painted bright pink in bed has clothing crown princesses and tulle in the header as a carriage rug is perfect. 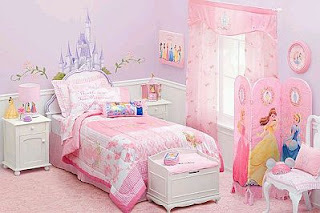 Cheerful and colorful proposal is a bed with pillows and blankets of the princesses, the furniture is white and pink walls and rugs and matching them to be of the same colors. This proposal is similar to the previous, bedding and pillows with the image of disney princesses and walls and curtains in pinks. In the other bedroom has a large sticker or poster of the princesses on one of the walls, the bed has a veil that covers it entirely. 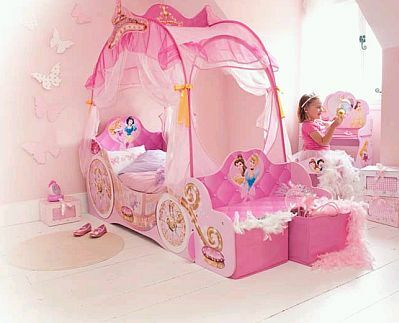 Finally, if you paint the walls in shades of pink, you put a butterfly, and finally a carriage shaped bed, sure to be your princess dream come true.